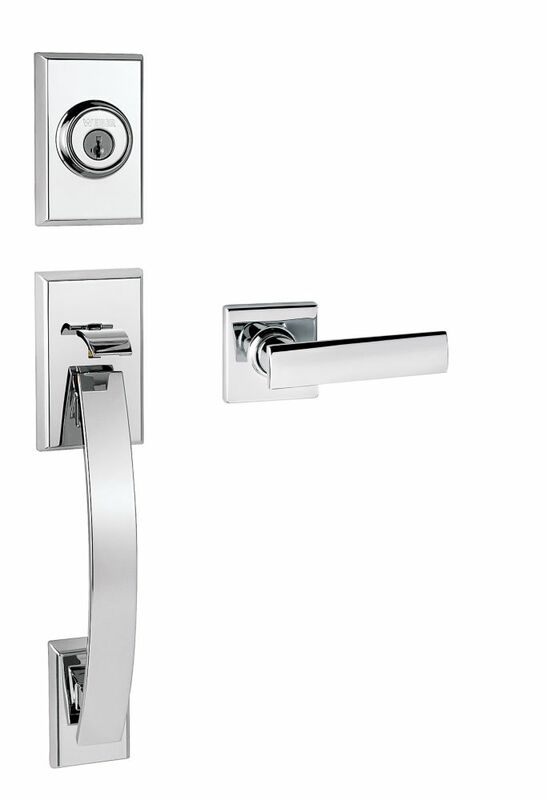 Collections by Weiser offers five handlesets to choose from. These handlesets offer solid forged brass construction and Grade 1 cylinders for uncompromised security. Make a modern statement with the sleek and stylish Tavaris handleset. Single Cylinder Handleset The bold form and clean, geometric shape of the Vedani lever reflect a contemporary aesthetic. The Polished Chrome is perfect for coordinating in a bathroom with polished chrome fixtures. Welcome Home Series handlesets are the perfect addition to your front door to create a unique and fashionable entryway to your home. Each is stylishly designed to provide maximum-security protection. There are many styles, finishes and configurations from which to choose. Welcoming and warm, the Augusta's features a soft, oval design style. Single Cylinder Handle Set Phoenix's decorative accents will complement any home decor to make a great first impression. The Antique Nickel finish offers a warm feel to the products style. Tavaris Single Cylinder Polished Chrome Handle Set with Vedani Lever Collections by Weiser offers five handlesets to choose from. These handlesets offer solid forged brass construction and Grade 1 cylinders for uncompromised security. Make a modern statement with the sleek and stylish Tavaris handleset. Single Cylinder Handleset The bold form and clean, geometric shape of the Vedani lever reflect a contemporary aesthetic. The Polished Chrome is perfect for coordinating in a bathroom with polished chrome fixtures.